VIP Registration is SOLD OUT. Standard Registration is SOLD OUT. Upgrade your Standard Registration by combining with Bike New York membership! For $150, you’ll enjoy all the perks of being a Bike New Yorker, plus guaranteed access to early registration for the 2020 Tour. Our Charity Partners ride in support of important causes. Click on a logo below to learn more about their work and join their team. PLEASE EMAIL CHARITYPARTNER@BIKE.NYC FOR INFORMATION ABOUT APPLYING to be a charity partner in 2020. On the first Sunday in May, 32,000 cyclists of all skill levels come from around the world to roll through every borough of New York City on streets totally free of cars. For one day, the roads are yours, the bridges are yours, the City is yours—there’s no better way to experience the Big Apple. Produced in conjunction with the City of New York, the TD Five Boro Bike Tour is the largest bike ride in the U.S., with proceeds funding our free bike education programs. Last year alone, we taught more than 28,000 kids and adults. When you ride with Bike New York, you’re helping us in our mission to empower more New Yorkers with the skills to ride safely and confidently on city streets. You can support Bike New York and promote your business at the Tour by becoming an exhibitor at the Finish Festival or purchasing ad space in the Tour program. If you would like to cover and/or ride the TD Five Boro Bike Tour as a member of the press, please complete and submit this form. 2019 Route & Services information coming soon. The 40-mile, car-free Tour begins in Lower Manhattan (the start line is at Franklin St. and Church St., with entrance points for each of the four start waves running south along Church to Battery Park), heads north through the heart of Central Park, and continues on to Harlem and the Bronx before returning south along the East River on the FDR Drive. From there, cyclists cross into Queens and then into Brooklyn, where riders take over the Brooklyn-Queens Expressway before the heart-pumping climb up—and thrilling ride down—the breathtaking Verrazano-Narrows Bridge and into the Finish Festival on Staten Island. Click here to download a PDF version of the map. Four Rest Areas and four Fluid Stations located along the route provide cyclists with snacks and water. All Rest Areas and Fluid Stations feature toilets, water, and bike repair. Rest Areas include food, sponsorship activations, and entertainment. Volunteer marshals and NYPD officers will be riding with you and stationed along the route to provide assistance and keep the Tour rolling safely and smoothly. SAG vehicles will be stationed at each Rest Area and will trail the back of the pack. If you are running out of steam or fall too far behind, SAG will transport you and your bike to the Finish Festival. Emergency medical technicians (EMTs), paramedics, and ambulances will be deployed along the route and stationed at Rest Areas to attend to medical needs. 1) Visit the route map on Strava. Be sure you have registered and are logged in. 2) Star the route by clicking the star next to the route name. 4) Find the TD Five Boro Bike Tour route and select “Use Route” to start your ride. 5) That’s it! Enjoy your five borough adventure. Bike repair will be provided at all Rest Areas, water stops, and the Start Area and Finish Festival. Labor is free, but there is a charge for parts. We strongly recommend that you bring an extra bike tube, and check your bike before the Tour. Musical acts, performance groups, and cheer zones will be scattered along the route to keep you going strong. Information tents located at each Rest Area and the Finish Festival are your go-to resources for all questions and concerns. They also make great rendezvous spots if you get separated from your friends. The Tour (and Expo) have been certified sustainable by the Council for Responsible Sport. In keeping with our green goals, we provide recycling and composting stations at each Rest Area and at the Finish Festival. Four free ferries per hour will take cyclists from Staten Island to Manhattan on a first-come, first-served basis. We suggest that those riders who are driving to the Tour park on Staten Island and take the ferry to the Start. Find more info here. Cyclists will have the opportunity to purchase photos of themselves after the Tour, courtesy of MarathonFoto. In order to be identified in photos, be sure your bike plate and bib are visible. Check at information tents at Rest Areas and the Finish Festival for items lost along the way. No luck? Please note that the tail of the Tour will be traveling just over 6 miles per hour. Riders at the back of the pack may be directed to take a shortcut that bypasses the Astoria Park Rest Area and leads directly to the Con Ed Learning Center Rest Area, trimming four miles off the route. 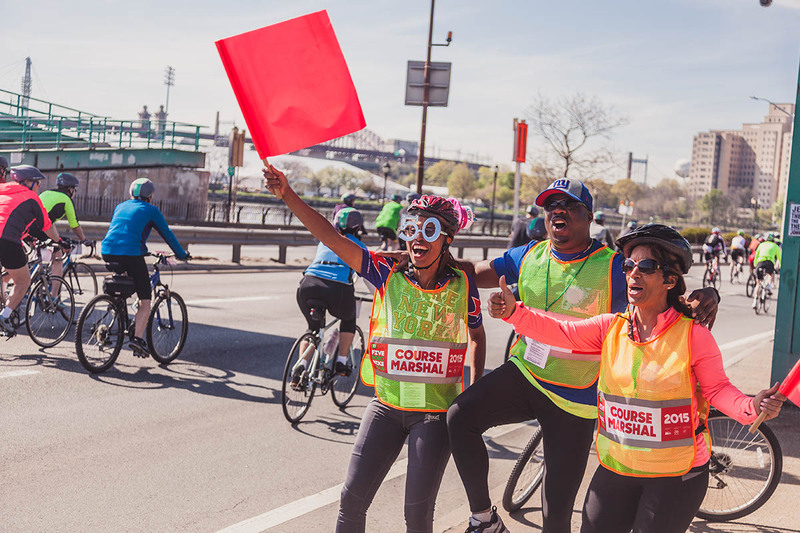 Due to the street closure schedule, all riders must be on the Brooklyn Queens Expressway (BQE) by 2:00PM; otherwise, your Tour will end in Brooklyn at mile 28. Please be mindful of the time you spend at the Rest Areas. If you do not make it to the BQE in time, see “Leaving the Tour” below. If you need to leave the Tour for any reason, we recommend doing so at the following locations. If you leave the Tour, you will be riding with motorized traffic and will have to watch for cars and road hazards. Mile 14: York Ave. and 63rd St. (Manhattan) This is your last chance to exit the Tour in Manhattan. If you don’t want to continue, travel straight on 63rd St. after the Tour exits the FDR Drive. Do not take the lefthand turn onto the ramp of the Queensboro (59th St.) Bridge. Subway The Tour passes near many subway stations. Bikes are allowed on the subway, but some unstaffed subway stations have turnstiles that do not accommodate bikes. Marshals and Information Tents at Rest Areas can provide more details on which stations to use. Visit www.mta.info for up-to-date info. By the time you reach the Finish Festival at Fort Wadsworth in Staten Island, you will have conquered five boroughs and five bridges—including the longest bridge span in the Americas. Kick back and relax. You’ve earned it. The Finish Festival is packed with delicious local vendors. Trust us—after putting in that many miles, you’re gonna be hungry. Get kitted out in official Bike New York and TD Five Boro Bike Tour gear—we’ll have shirts, jerseys, water bottles, and much, much more. All proceeds fund our free bike education programs, so shop away! Get your photo taken with that beast of a bridge—the Verazzano, that is—in the background at the TD Bank Photo Booth. Labor is free, but there is a charge for parts. Be sure to bring an extra tube with you. Listen to local bands and stop by exhibitors’ booths for great giveaways. As we all know, bike swag is the best swag. Courtesy of the New York City Fire Department Emergency Medical Services and the Jamaica Hospital Medical Center. Plan to reunite here if you get separated from your group along the way. Fort Wadsworth is closed to the public on Tour day. Unregistered friends and family cannot enter the Finish Festival. When is the next TD Five Boro Bike Tour? The 42nd Annual TD Five Boro Bike Tour will take place on Sunday, May 5, 2019. Standard and VIP registration are sold out. Register here to sign up as a Charity Rider. Standard and VIP registration are sold out, but you can still sign up as a Charity Rider. Learn how here. Any registered individual. All interested and willing parties are invited to participate. We intend to create an event that adheres to principles of social equity and inclusion and is open, welcoming, safe, and accessible for all who have an interest in participating provided that they have obtained a valid pass of entry to the event. Are there age restrictions for riding in the Tour? Children under the age of 3 are not allowed on the Tour. Youths ages 3 to 9 must ride with an adult on a tandem bike, in a child’s seat, on a tag-along bike, or in a bike trailer. Youths ages 10 to 17 may ride their own bikes, but must remain in close proximity to the adult with whom they were registered. Can international riders participate in the Tour? Yes! Every year, we welcome cyclists from dozens of countries around the world. How much does it cost to ride in the Tour? The price for standard registration is $110 (plus processing fees), $22 of which is a tax-deductible charitable donation. VIP registration is $350 (plus processing fees), $73.50 of which is a tax-deductible charitable donation. All Tour fees are non-refundable, non-deferrable, and non-transferable. Tour fees are subject to change from year to year. Proceeds from the Tour fund our free bicycle education programs. In 2018 alone, we taught bike riding and bike safety skills to more than 28,000 kids and adults throughout New York City. I plan on riding a tandem with my spouse/friend/child. Do we both need to register? Yes. All participants must register. Youths must be registered by a parent or guardian, and must be on the same team as their registered parent or guardian. Children under the age of 3 are not allowed on the Tour. You are allowed to register others, but we recommend registering individually. If you choose to register others, you must collect all of their personal information before you do so, including date of birth, emergency contact name/phone, mobile number, email address, mobile provider, etc. Please note that registration will only become valid after the participant you register has personally signed the Event Waiver. The Event Waiver will be emailed to the email address provided for that participant. How do I verify that I am registered for the Tour? If you received a confirmation email, you are registered. If you don’t receive an email within one day of completing registration, go here to confirm your registration. If you don’t find your name, you are not registered. Are there refunds on any registration purchases? Can I sell or give away my entry? No. Registration is non-refundable, non-deferrable, and non-transferable. If you decide not to ride, we can convert your full registration fee into a tax-deductible charitable contribution. Please contact Bike New York as soon as possible if you want to explore this option. When can I order the Tour registration jersey? The Tour registration jersey is available during the online registration process and for a limited time to registered riders, who will receive a link to this exclusive offer in their email. Where can I find sizing information for the Tour registration jersey? Sizing information for the Tour registration jersey can be found here. Can I return/exchange my Tour registration jersey? No. All jersey sales are nonrefundable and nontransferable, so be sure to consult the fit guide before ordering a jersey. When will my Tour registration jersey arrive? Standard participants who purchase a jersey within registration will have it shipped to their registered shipping address within the month of April. VIP and Standard participants who have an international shipping address will pick up their jersey at Bike Expo New York with their rider packet. What are staggered start waves? How can I guarantee that I'll be assigned to the first Start wave? If you’d like to ensure a spot in the first Start wave, you should plan to register as a VIP or Charity Rider. How can I ensure that I am assigned to the same Start wave as my friends and family? To guarantee that you’ll be assigned to the same Start wave, you must be on a team together. If you were unable to create or join a team with your group during registration, you may adjust, create, or join a team at any time by visiting your participant page. A team is a collection of standard riders who wish to be placed in the same Start wave. You can join the team created by your friends and family or create a team for your friends and family to join either at registration or afterward on your participant page. What’s the best way to organize a team? Select a team captain first. This person will be in charge of creating the team and sharing the team name with everyone else. Once this person has registered, everyone else can join that team either within registration or on their participant page. Can VIP and charity riders join a team? No, but remember: VIP and Charity Riders can ride in any wave and therefore can ride with whichever team they choose. How can I edit my team and registration details? Want to add people to a team after you’ve already registered? Go to your participant page and enter your confirmation code to edit these and other details. What if I am late to my designated staggered start time? Simply depart with the following start wave. Please note the last wave departs at 9:20 AM. All riders must cross the start line by 9:50 AM. Can I start at an earlier start time? No. Riders are only permitted to fall back into a later start time. Can I start farther along the Tour route and avoid the Start Line? No. Riders ­must depart from the designated Start Area during their assigned start wave. What sort of accommodation options does Bike New York offer to riders who are traveling from out of town? Bike New York has partnered with onPeak to provide you with hotel options for your trip to New York. Through this partnership, Bike New York and onPeak are able to offer discounted nightly rates at hotels throughout the city—and the best part about it is that a portion of the proceeds from rooms booked through OnPeak help fund our free bike education programs. Check out OnPeak’s housing options here! What if I can't bring my bike/don’t own a bike? We’re partnering with Unlimited Biking to arrange for bike rental pick-up right at the start of the ride and drop-off at the Staten Island ferry (St. George ferry terminal) before you get on the boat back to Manhattan. Stay tuned for more information about how and when you can register. How will I receive my rider packet and rider identification kit? All participants must pick up their packet and rider identification kit (helmet cover, bib, and bike plate) at Bike Expo New York. More information about Bike Expo New York 2019 and Packet Pick-Up will be shared soon. For now, click here to learn more about packet pickup. Where is Bike Expo New York/Packet Pick-up? Bike Expo New York will be held from May 3–4, 2019, at Basketball City in Lower Manhattan. Learn more here. Can you mail me my rider packet and rider identification kit? No. All participants are required to pick up their packet and rider identification kit (helmet cover, bib, and bike plate) at Bike Expo New York, either in person or via proxy pick-up. What if I can't attend the Expo to pickup my rider packet? If you cannot attend the Expo to pick up your rider packet, you may designate a proxy to pick it up for you. Click here to learn more about proxy packet pickup. Can I pick up someone else’s rider packet for them? Yes. Individuals (including non-riders) may pick up a maximum of five (5) proxy packets. Click here to learn more about proxy packet pickup. My child is riding with me in the Tour, but cannot attend the Expo. Can I pick up their packet? Yes. As long as you are registered as your child’s adult guardian for the Tour, you can pick up their packet as a proxy. Click here to learn more about proxy packet pickup. What forms of identification do I need to pick up my packet? Residents of the United States and Puerto Rico must show state or federal government-issued photo ID, such as a driver’s license, DMV photo ID, or passport. Non-US residents, including Canadian residents, are required to show a valid passport. Participants should also bring their barcode with them to expedite the packet pickup process. When will I receive my barcode? Your barcode will be emailed to you a few days before the Tour. If you do not see the barcode email in your inbox you can retrieve your barcode from the public participant page by searching your name and copying/pasting your unique barcode URL into a new browser tab or window. Your barcode will be posted on the public participant page in April. What is the route for the Tour? The TD Five Boro Bike Tour is a 40-mile, traffic-free ride through all five boroughs of New York City. 2019 route information coming soon. Click here for the route description and map for last year’s Tour. Do I need a helmet for the ride? Yes. Helmets are required to participate in all Bike New York rides. For the TD Five Boro Bike Tour, you must also display all three components of the rider identification kit (helmet cover, bib, and bike plate) for the duration of the ride. Don’t have a helmet? Well, you’ve come to the right place! Can I wear headphones/earbuds while I ride? No. You may not wear earbuds or any other form of headphones. According to NYC law you may wear one earbud, but keeping your ears clear is a much safer choice. Rather than bring your own playlist, we recommend that you enjoy the live music you’ll encounter all along the route. What kind of bike is allowed on the Tour? Any human-powered bicycle (recumbent, unicycle, tandem, tricycle, etc.) is permitted, as well any pedal-assist bicycle, defined in the Rules of the City of New York, Chapter 4, Title 34 as: a bicycle equipped with fully operable pedals and an electric motor of less than seven hundred fifty watts (one horsepower) whereby such electric motor engages only when the operator is pedaling and the rate of speed of the bicycle is less than 20 miles per hour, and disengages or ceases to function when (i) the Section 4-01 4 operator applies the brakes, (ii) the operator stops pedaling, or (iii) the bicycle achieves a speed of twenty miles per hour. Absolutely no electric assisted bike outside of this definition will be allowed in the Tour. While the Tour provides snacks and water at the Rest Areas, don’t forget to bring two bottles of water, some snacks, sunscreen, and a spare tube in case you get a flat. You will want to pump your tires full of air the day before. Don’t forget a fully-charged cell phone (and portable charger if you have one), camera, and cash for food and merchandise at the Finish Festival. Check the forecast before you set out to ensure that you’ll be dressed appropriately for the weather. Can I bring a bag on the Tour? If you suspect that one or more of the above criteria applies to your bag, do not bring that bag. If you do, you run the risk of having your bag (and any personal belongings in it)confiscated. Bike New York is not responsible for confiscated property. Confiscated property will not be returned under any circumstances. Here’s some more info. No, we do not provide bag check services or facilities on the Tour. This is a rain-or-shine event. Check the weather and dress appropriately. Is there a recommended app for tracking my ride during the Tour? Strava! Visit the TD Five Boro Bike Tour route on Strava to get a detailed, turn-by-turn map of the event. You can even download the route to your Garmin or smartphone. And if you’re looking for training partners or some company on the ride, check out the Bike New York club on Strava. Don’t forget to upload your Tour after you complete your ride! What should I know about the Finish Festival? The Finish Festival takes place at Fort Wadsworth on Staten Island, where riders can celebrate their Tour with bike demos, giveaways, music and entertainment, food concessions, product samples, stretching, massage, a photo booth, and official merchandise for sale. Don’t forget to bring cash to purchase lunch! Is lunch provided for riders at the Finish Festival? Lunch is provided for VIP and Charity Riders. Standard riders may purchase food from a variety of vendors at the Finish Festival. Please note that food vendors are cash-only. All Rest Areas along the route will provide complimentary snacks and refreshments. Can my friends or family meet me at the Finish Festival? No. For security reasons, the Fort does not permit visitors during the event, and only registered riders are allowed at the Finish Festival. How do I get back to Manhattan at the end of the Tour? After leaving the Finish Festival at Fort Wadsworth on Staten Island, you can proceed to St. George’s terminal (about a 4-mile ride) to take a free ferry back to Battery Park in Manhattan. What happens if I start the ride, but cannot finish it? Mile 14: York Ave. and 63rd St. (Manhattan). This is your last chance to exit the Tour in Manhattan. If you don’t want to continue, travel straight on 63rd St. after the Tour exits the FDR Drive. Do not take the left-hand turn onto the ramp of the Queensboro (59th St.) Bridge. Subway: The Tour passes near many subway stations. Bikes are allowed on the subway, but some unstaffed subway stations have turnstiles that do not accommodate bikes. Marshals and Information Tents at Rest Areas can provide more details on which stations to use. Visit www.mta.info for up-to-date info. Note: if you are unable to finish the Tour, you may also take a SAG vehicle to the Finish Festival. What is a SAG vehicle? SAG stands for support and gear. They are stationed at each Rest Area and will trail the back of the pack. If you are running out of steam or fall too far behind, SAG will transport you and your bike to the Finish Festival. Is bike repair offered along the Tour route? Yes. Each Rest Area will have a free bicycle mechanic station for minor repairs. Rider assist marshals should be able to offer some assistance for minor repairs while on the route. Please note that on-site mechanics will not be able to provide support for more extensive repairs, and service from a bike shop may be required. We strongly recommend that you bring an extra bike tube, and check your bike before the Tour. Here’s some info to help with that. Will there be refreshments along the Tour route? Yes! Each Rest Area will have all sorts of nutritious snacks and goodies to keep you going until the end. For those with dietary restrictions, we suggest that you bring your own snacks to ensure you’ll have the right ingredients to get you to the Finish. How can I find out where Rest Areas, Fluid Stations, and bike repair hubs are located along the Tour route? Click here for the route map to see locations of Rest Areas. Each Rest Area and water station will have water, bike repair, and toilets. Are there designated areas for lactation along the route? Each of our medical tents at our four Rest Areas and at our Gowanus Water Stop can be fully enclosed and used as a lactation space. What if I lose something while riding? We ask all riders who find lost possessions on the route to hand them in to a staff member and let him/her know where the item was found. If you lost something, ask a representative at the information tent at the Finish Festival if it has been turned in. You can also email Bike New York with a description of the item and a note about where you think you lost it. If your item is turned in, we will contact you. The TD Five Boro Bike Tour and Bike New York are not responsible for lost or stolen items. What if I lose track of my friends/family during the Tour? Make a plan in advance with your friends/family in case you get split up. Rest Areas are a good place to meet up with friends. There is a “Reunion” area at the Finish Festival, which is a good place for you to rendezvous after your ride. Do not stop in the following locations: Central Park, on any of the bridges, or on the Brooklyn-Queens Expressway (BQE). Out of courtesy for other riders, do not stop in the middle of the roadway; always pull over to the right side of the road if you need to stop for any reason. There will also be an information center at the Finish Festival where riders can rendezvous. Can I bring a pet on my bike? No. Kindly leave furry and feathered friends at home for the Tour. How can I lessen my environmental impact and help make the Tour more sustainable? Bike New York encourages participants to use our Zero Waste stations and do their part to properly sort trash. Check out our sustainability page for more info. Click THE “full screen” icon in the lower right Corner of the program to view (recommended). Download a HIGH RES PDF here. Access Start Corridor via Warren (East side only), or Murray. After 7:50 join Start Wave 2. Access Start Corridor via Barclay (West side only) or Vesey or Dey (East side only). After 8:30 join Start Wave 3. Access Start Corridor via Cedar or Rector. After 9:15 join Start Wave 4. Access Start Corridor via Battery Place, Bowling Green, or Morris. Includes: All standard registration perks, plus guaranteed placement in the first Start Wave, special VIP Packet Pickup line at Bike Expo New York, official 2019 TD Five Boro Bike Tour jersey, Bike New York–branded bag (meets Tour baggage requirements) by Manhattan Portage, timed climb over the Verazzano-Narrows Bridge, breakfast and entertainment at the Start, and access to exclusive VIP lounge & gourmet lunch at the Finish Festival. No bags with shoulder straps (including backpacks, messenger bags, hydration packs, and drawstring bags), no panniers or bags that hang on the side of your bike, no covered baskets, and no bags over 420 cubic inches. Here’s some more info. The RIK comprises a reusable helmet cover, a recyclable Tyvek bib*, and a bike plate made from an environmentally friendly material called Ultra Green. In order to ride in the Tour, your bib must be affixed to the front of your shirt or jacket, your bike plate must be attached to your handlebars, and you must wear the helmet cover over your helmet. *We will be collecting rider bibs for recycling at the Staten Island Ferry. Have your RIK visible at all times: attach the bike plate to your handlebars, affix the bib to the front of your shirt or jacket, and wear your helmet cover. You will be asked to leave the Tour if any element of your RIK is missing. You may use a pedal-assist e-bike allowed on city streets, defined by New York City as: a bicycle equipped with fully operable pedals and an electric motor of less than seven hundred fifty watts (one horsepower) whereby such electric motor engages only when the operator is pedaling and the rate of speed of the bicycle is less than 20 miles per hour, and disengages or ceases to function when (i) the Section 4-01 4 operator applies the brakes, (ii) the operator stops pedaling, or (iii) the bicycle achieves a speed of twenty miles per hour. No electric assisted bike outside of this definition will be allowed in the Tour. Ride in a straight line. If changing lanes or pulling over, look first and then signal to show which way you’re planning to go. Use hand signals to indicate that you are slowing down, stopping, turning, or changing lanes. Move completely to the side of the road if stopping for any reason. Do not wear earbuds or headphones. If you’d like to learn the rules of the road with help from a League of American Cyclist certified instructor, take our free Street Skills class. Cell phone (If you are riding with a child who does not have a phone, please make sure to write your cell phone number and name on the back of your child’s bib. Water bottles (you can refill them at Rest Areas and Water Stations along the route). Water bottles will not be provided. A youth is anyone under the age of 18 on the day of the Tour. Each youth must be registered on the same team as a parent or guardian riding in the Tour. Adult to youth ratio must be 1:1. No exceptions. Youths ages 10 to 17 may ride their own bikes, but must remain in close proximity to the adult with whom they are registered. Plan ahead in case you get separated from your youth. Instruct them to seek out a Marshal wearing either an orange or yellow vest. The Marshal will guide them to an information tent where staff can communicate with Tour Command to reunite you. In order to be assigned to the same start wave as your friends and family, you must create or join a team during registration or afterward on imATHLETE. Make sure you and others in your team have stored important numbers and contact info on your phone, including that of someone not riding in the Tour, your hotel, your team members’ home and cell numbers, etc. If you get separated from your team, continue to the next Rest Area and look for them there. Do not pull over to the side of the road to wait for them. MarathonFoto will be there to capture your images. Smile for the camera and check out your personal photo gallery after the ride. You’ll get an email with a link to your photos the week after the Tour. We recommend that participants driving to the TD Five Boro Bike Tour carpool and park in Staten Island in the morning. Parking will be easier and you’ll avoid waiting for the ferry at the end of the day. If you park on the street, please observe all posted parking restrictions. Cars parked along the Tour Route will be towed. Due to ongoing construction, there will be limited parking in the Staten Island Ferry lots, but don’t worry, there are plenty of nearby alternatives. Click here for parking options. We’ve partnered with onPeak to provide you with hotel options for your trip to New York. Through this partnership, Bike New York and onPeak are able to offer discounted nightly rates at hotels throughout the City—and the best part about it is that a portion of the proceeds from rooms booked through onPeak fund our free bike education programs. We’re quite partial to this option. From anywhere in Manhattan or downtown Brooklyn, the best way to get to the Start Area is by bike. The Hudson River Greenway and Broadway both lead directly to Bowling Green. For detailed directions, use Google Maps to plan your route. Be sure to click the bicycle icon. Also, the NYC 2018 Bike Map is a great resource for mapping your ride. Note that some subway stations do not accommodate bikes. The MTA requests that participants do not bring bikes on the L/M/G trains. Visit www.mta.info for customized travel directions using TripPlanner, or call the MTA for more information by dialing 511. Check the schedule for changes as Tour day approaches. From Hoboken, take the PATH train toward 33rd St. and get off at the Christopher St. stop. From Newark, Journal Square, Grove St. and Exchange Pl., take the 33rd St/HOB train and get off at the Christopher St. stop. From Christopher St. connect with the West Side Highway bike path and ride south to your correct start wave entrance. Please be aware that all PATH trains to World Trade Center (WTC) will NOT be running. The fare is $2.75, payable by MetroCard. Bikes are not permitted on the first car of the train. Note that you will need to use stairs to get to street level, so be prepared to carry your bike. For up-to-date information, system map, station locations, and parking information, visit www.panynj.gov or dial 1-800-234-PATH. The Manhattan stop for the LIRR is Penn Station, at 34th St. and 7th Ave.
At Penn Station, cyclists can transfer to downtown subway service or bike downtown to Bowling Green. On Tour Day, off-peak fares apply and bike permit rules are suspended. Cyclists should attempt to distribute themselves evenly throughout the train to facilitate the flow of customers boarding and disembarking at stations. Bring an elastic bungee cord to secure bikes to the train. For more information, updates, and departure times and station locations, visit www.mta.info/lirr. Ronkonkoma Branch: Busing between Hicksville and Ronkonkoma (buses cannot accommodate bicycles) More here. Huntington/Port Jefferson service: Service reduction from half-hourly to hourly/every 90 minutes to every 2 hours. More here. Port Washington Branch: Service reduction from half-hourly to hourly. More here. Take Metro North to Grand Central Station at East 42nd St. and Park Ave.
To get to Bowling Green via subway from Grand Central Terminal, take the 4, 5, or 6 train to the Brooklyn Bridge or City Hall stations. For more information on departure times and station locations, visit www.mta.info/mnr. NY Waterway will provide ferry service from Paulus Hook in Jersey City to the World Financial Center Terminal in downtown Manhattan. $5 one way, plus a $1 bicycle surcharge. The bicycle surcharge will be waived until 8:30AM. Ferries depart every 15 minutes. If you’re coming to New York City for the TD Five Boro Bike Tour, then make sure to check out the nycgo.com 2019 TD Five Boro Bike Tour Visitor Guide for official visitor information to help you plan your trip! The guide is a great resource for everything you need to know regarding where to stay, eat, drink and play while you’re in town.